I really like that plan but I wish it had ratcheting tensioner, is that something easy to mod? The tensioner is easily modified!! However I have never had trouble with my spring I used!! Here is another modification I made after I got mine up and running! Looking at the tracking pivots. I put a bolt in from the tracking pivots. From the opposite side of the tension arm I put a threaded cap screw to use as an adjustment!! I will try to show you this in a pic later on! That tension arm as little a part it seems to play is ultimately important. The third wheel of the three runs off of it! The tracking adjustment basically just raises and lowers the tracking roller mount to track the belt. However if that arm is the least and I stress the least out from square with the other two wheels you will have to track the belt way off to one side or the other to make it track correctly. When I got mine altogether I noticed that to track it I had to actually roll the tracking so far out the belt was running slightly off one side of the tracking pulley. I didn't like how it looked, (even though it did not seem to effect the overall running of the belt). One night after running the grinder a while I backed of and something caught my eye. I have been doing carpenter work all my life and I can see a warp where no one else sees it!! I remembered that when I drilled the hole for the hole for the tracking tension and support arm, the hole walked on because of a dull bit!! That is where the pivot for the tracking and tension arm pivots off of! So I turned the machine on and watched the belt run. It was running true but the tracking pulley was off!!! that is when I realized that the position of the tracking and tension arm was the problem!! Now how to fix it. I still had enough of the steel that the arm was made of and tracking and tension support was made of the same!! I cut a new support arm drilled it and installed the new arm. This where the adjustment from up above came into play. Realizing that a hair off multiplies by distance. You being a sniper will understand that principle!! I already had the holes in the piece you see that the tracking and tension arm mount onto. This was the only weld I did on the entire build but I got the tracking and tension arm square to top of main arm slide and I tacked it. Then I came on the back side of it and welded it. With the other adjustment you can dial it in for tracking the belt perfectly!! This is a pic of where I made the adjustment on my clone!!! OH HOW I HATE PHOTOBUCKET ANYMORE. I hope you are able to see these photos!! This a shot of my KMG clone and the backside of the tension and tracing arm. If you look close you will see the set screws I used for adjustment! In this pic you will see after I used the set screws to make the adjustment need I permanaately shimmed behind the tracking adjustment! All pieces will need to be flat iron, or you will loose you square and true! The very reason none of this is welded is because if you weld it you will get warpage. That warpage will cause it too be unsquared and untrue and you will never be happy with the finished product. You must have a way to drill square and true, (a good drill press) or it will not turn out well! When I did the top and bottom to slide arm. I set it up like the finished product would be and I clamped it around the arm material with a few thousands shim, (to keep it from being to tight on the arm)! I marked the holes with a center punch and drilled the correct size for 1/4 x 20 tap. For all of the holes top and bottom. Then you will have to go back and step up to the next size bit so a 1/4 x 20 screw will pass thru it, and counter sink the holes! However by doing it this way you do not have to worry about the holes wandering or not matching!! Here is a pic before it was mounted and the hole cut for the belt to the step pulleys! Or at least I hope you can see these pics! I am looking for the cut list. The original plans I had included a cut list. Found this while looking for the cut list! You might also check out the Sayber OSG plans. Looks like a good grinder. 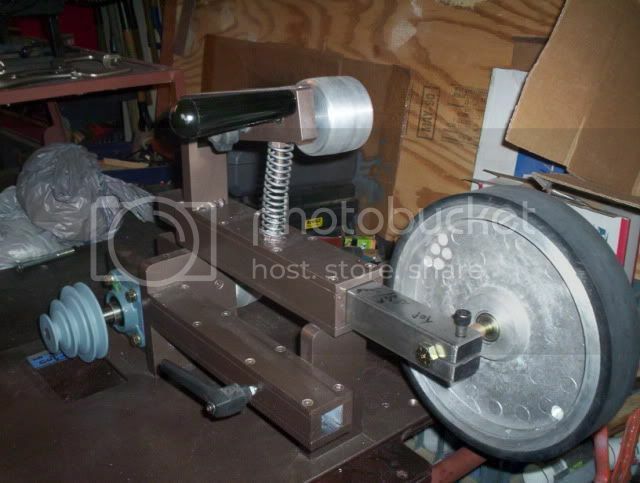 You might wish to check out this thread for a grinder build. Some good ideas, and as always most plans I'd mod a tad for my use. If you can afford it go with the TW-90. If I had the money that is the one I'd go with. and I own a KMG. I've had experience with the ratcheting belt tension mechanisms, and for the most part they are great. Notice I said "for the most part"..... where I came to dislike them is when using J weight belts..... I'd grind a bit, and any J weight belt would have to be retracked back to center, time and time again. I finally figure out what was going on..... as the belt heated up, it would stretch to the limit of the small spring that was suppose to keep it tight, and because of the "ratchet" mechanism, it would reach the limit of it's ability to hold the belt tight. At first I thought no big deal, just reach up and give the ratchet adjustment another click or two..... that was until I did that with a mylar backed belt..... it flew off the machine, and I took a nice gash on the right side of my face from the belt edge. I tend to be very cautious around grinders that use that type of belt tension setup now. That doesn't mean they aren't "good"...... they're just not good FOR ME. I know I've said it before, but it bears repeating that there is no one grinder out there that is "perfect". In my experience you will either need to modify the grinder to your liking, or adjust your usage/methods to the grinder. I'm of the first one. Because I have experience with many different grinders, when considering a grinder, I look for the one(s) that offer me the least necessary modification to make it work as I want it to. In the past it was much easier for the "new guy".....there were only 3-4 choices for "good" 2x72" grinders, and no matter which one you chose, it was a safe bet you'd have a very high quality machine that would last a lifetime. That all changed when knifemaking became the "vouge" thing to do..... most of the "Johnny come lately" outfits offering grinders are looking at only the dollar signs, plagiarized existing designs, and adding what they they think is"cool factor". In many ways I view the current grinder market like I do the Made in China knives..... rip off designs, that are far lesser machines then the originals. Erase KMG off your list. Old technology. Much nicer direct drives for same or less $$. I bought a Wilmont LB1000 kit for $800. I bought 1 1/2 hp motor and TECO VFD for <$300. wiring and such was from office scrap. it uses 1 1/2" tool arms which can be made with thick wall tube or solid. mounted kit base to 1/2" steel plate from office with 1/2" rubber gasket between base and mount. plate is bolted to 3" oak which is bolted to work bench which is bolted to shop wall. kit took 30 minutes to assemble. i second direct drive, I can change motors in 10 minutes. find a 3" drive wheel as well as a 4" or 5" drive wheel. when you start finishing, you will need the slower speeds from a 3" drive wheel. Glad you mentioned about the ratcheting system - I'd been thinking I wanted to add that to my grinder. Then I read another place about the J weight belts stretching under use, and with your confirmation I think I'll pass on the ratchet system. Ed, you've saved me some work. Thanks. And for me the ratchet is a must. I wouldn't consider a grinder without it. I've used a lot of J-Flex and have never had an issue with tracking or belt breaking. Try both grinders if you can, see what works best for you. I worked tool & die for quite a few years and could have build my own grinder. And I could have gotten it right. However, I bought a TW-90 instead. Why? There were a number of reasons but what it really came down to was the fact that I could. The TW-90 was a shortcut to a high quality machine. For me, I like the ratcheting system. Never had a tracking problem or belt break because of it. I have broken belts (my fault) and there's a guard above the tensioning wheel that saved me from anything more than a change of underwear. Another thing with building vs. buying is resale value. I could put my grinder up for sale right now and probably have it sold by lunch. Recouping much of my money. A home built machine is the opposite IMO. Myself, I would never buy a homemade machine from anyone. Other than for parts. You'd never know what you're getting. I've had them all, but always preferred my Square Wheel. Stiill got it and use it for everything, even sharpening drawing pencils. Very wise words. I have a student in the shop right now, who is on the fence about building or buying a grinder. I told him the very same thing. I explained the precision aspect necessary, and got a startled looked. Many of those who attempt to build, do so with the idea in mind that they are going to save a bunch of money, however, what they don't realize/understand is the level of precision necessary to create a machine that works as expected. That being said, those with experience tend to be the ones who can pull it off, where as beginners generally don't have the experience level necessary to create the level of precision needed. i would see if there are grinder makers or knife makers near by that would let you see in person and maybe use a grinder before you pay money for it. i was able to use several Wilmont and other brand name grinders before i decided on which one to buy.